You can write your proposals, business plans, grants, reports and other business documents in many different languages besides English. 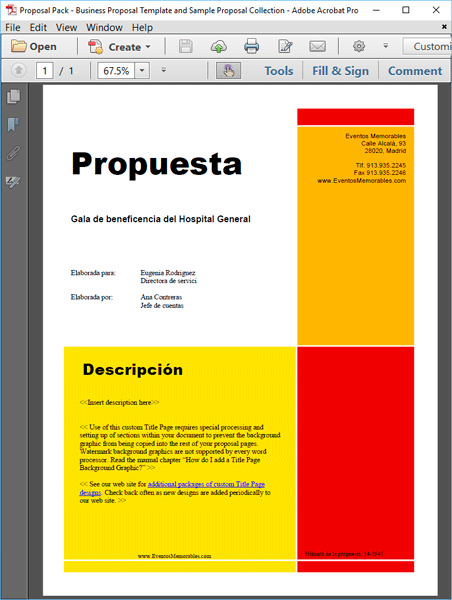 Proposal Kit provides a suite of templates, samples and Wizard software features that support creating multilingual documents. The Wizard software even supports Arabic Right to Left formatting. There are hundreds of design themes and color schemes to pick from that work in any language. 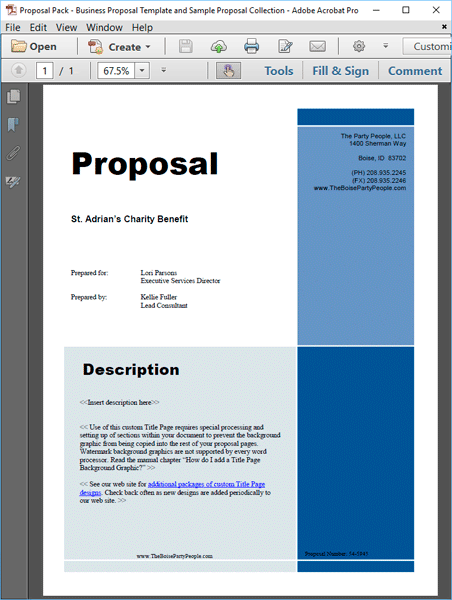 Following are three examples created by the Proposal Kit Wizard - Expert Edition software and Proposal Pack. The Wizard will automatically translate the titles and short phrases. You can see in the example the only element left in English is the description paragraph which you simply replace with your own text in your own language. 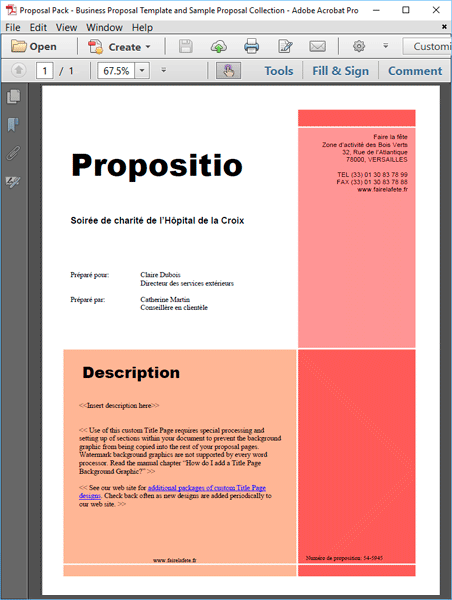 The Proposal Kit software does not translate all of the text of the documents it creates or provide complete translations of every stock template and sample. The multi-lingual features are meant to assist in the creation of a document in non-English language. The main purpose of the translated samples are to help show that proposals can be written with the product in any language. For example, all of the instructions and interfaces will still be in English and all of the body text (i.e. the text you replace with your own information in your own language) is in English. The Wizard software will replace the chapter headers on each template page as well as a number of short phrases used in various templates with foreign language translations while it is assembling your document. Once assembled you will then replace the rest of the English text with your own information - and in doing so your own writing will automatically be in your own language. Since the product documentation, template instructions, interfaces, etc. are in English you will need to be able to read English to use the system - your final versions of your documents you will present to your clients or end readers will be in your own language once you have completed your editing. All customer support provided by Proposal Kit is in English. We are unable to respond to help requests in non-English languages. Some language translations such as Canadian English, British(UK) English and Australian English only translate a small set of page headers and phrases. One example would be if you selected the "Labor Rates" template you would see the page header translated to "Labour Rates".